This 15 Foot Tropical Blast Slide is wonderful to cool off in the summer. It is perfect for your Children to slide and splash around in on a Hot Tucson day. Jumpmaxx has the best inflatables in Tucson Arizona. This slide is fast and fun and made to make your event a fantastic. Jumpmaxx Your Party Supply Headquarters. The 15 Foot Tropical Blast Slide is great for your children of any age. They will have fun splashing into the small pool at the bottom of this 15 Foot Tropical Blast Slide. Envision a Tropical getaway warm beaches and sand, providing your children with a fun filled diversion from everyday life that you will be proud to have entertaining your little guest. Jumpmaxx looks for units to make your party stand out. We love to be Tucson premier inflatable slide vendor. Make you and your party the best it can be. Book your mini Tropical Slide and find out what a pleasure entertaining your family, friends and guest can be. Tucson is hot cool and refreshing water slides can be your answer to making and keeping guest happy and entertained for hours of fun and enjoyment for your children and guest. 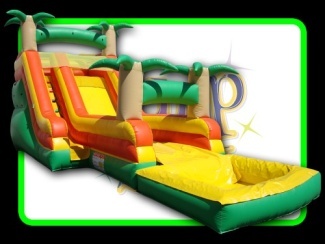 JumpMaxx prides ourselves in providing America with newer, cleaner, high end entertainment with inflatables like the 15 Foot Tropical Blast Slide and many others.